by Louis, Samia, Guirges, Nessim, Soliman, Iman A.
Louis, Samia, Guirges, Nessim, Soliman, Iman A. Drawing on her years of experience as an Arabic instructor and course developer, Samia Louis has used a functional approach to create a bright, innovative coursebook for the study of Egyptian colloquial Arabic--the spoken dialect most frequently studied and most widely understood in the Arab world. Designed according to the ACTFL guidelines for teaching Arabic as a foreign language, in ten highly structured lessons Kallimni ?Arabi trains students in the crucial skills, with particular emphasis on listening and speaking. 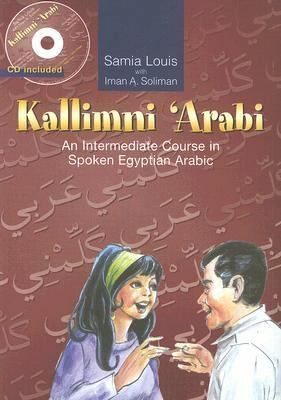 The accompanying audio CD carries recordings of the dialogues and exercises in each chapter, made by Egyptian native speakers.From the basics of communicating (asking directions, the language of shopping) to more advanced conversations (future plans, hobbies and free time), Kallimni ?Arabi is structured so that students learn Egyptian Arabic using real-life situations and expressions. The key topicscovered gradually lead students to understand, use, and speak Arabic, rather than simply memorize fixed phrases. Kallimni ?Arabi is aimed at students with some ability to read and write Arabic, who have had the equivalent of 30 hours of a beginner Colloquial Arabic class or 40 hours of a Modern Standard Arabic program.Louis, Samia is the author of 'Kallimni 'Arabi An Intermediate Course in Spoken Egyptian Arabic', published 2007 under ISBN 9789774249778 and ISBN 9774249771. Loading marketplace prices 14 copies from $8.79 How does the rental process work?